After three days of training, game day dawned the squad boarded a coach to take them over the bridge to North Vancouver for the captain’s run. 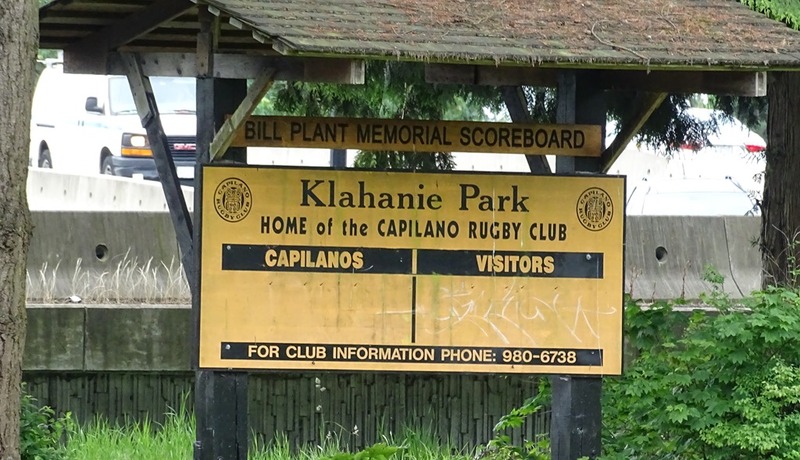 The venue was Klahanie Park, home of Capilano Rugby Club, surrounded by trees and with a nice clubhouse that most clubs in England would be very happy with. A storm a week earlier had left the pitch underwater but it had recovered in time although there were still some patchy areas. Coach Shanahan put the players through their paces practising kick-offs and other set pieces and once he was satisfied that the squad were ready it was back to the University for final preparations. Meanwhile Brian and I went downtown for a final wander around the city centre and went to Steamworks for lunch which brews it own beer. After sampling some stouts, pilsners and West Coast IPAs it was back to the hotel to change and meet the team back at Capilano RFC. In contrast to the quiet and deserted club of the morning, the stands were already filling up over two hours before the 7pm kick-off as there was a curtain raiser featuring womens teams from Vancouver and Vancouver Island. What followed was a high quality game between two sides that included some Canadian internationals and either team would have given any top womens team in England a run for their money. Afterwards the women stayed on the pitch to form a guard of honour for the BC Rugby and England Counties players. I felt quite a sense of pride as the Counties skipper led his team out resplendent in their white kit with the red England Rose and we prepared for the anthems. When I met the British Columbia Rugby officials a couple of days earlier they checked to see what should be played, God Save the Queen or Jerusalem. I mischievously thought about telling them that Swing Low would be appropriate but decided that I had better stick to protocol. It should have come as no surprise that a large number of English expats had come along and helped us perform a decent rendition of the National Anthem, however several hundred Canadians made sure the home anthem was comfortably sung the louder. The British Columbian team had not had much opportunity to train together and perhaps that was the underlying reason for the first Counties try, a relatively straightforward clearance kick being charged down by centre Sam Winter. Loose-head prop Dan Seal was causing his opposite number all sorts of problems and the first three scrums yielded penalties, two of which were converted into points by fly-half Gabitass and England Counties were 13-0 ahead after 20 minutes. Their dominance continued with two more tries for a 27-0 half time lead, but the home side got themselves more organised in the second half and began to threaten the Counties’ line. 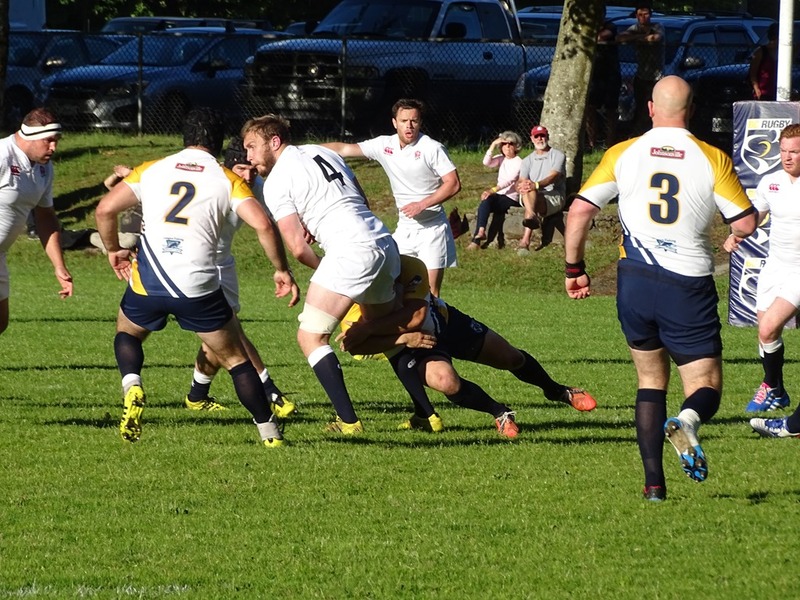 Excellent defence kept BC Bears scoreless and two England tries from the backs made the final score 41-0. The game was played in good spirit throughout and the large and knowledgeable crowd, about half of whom were female, appreciated good play, although the biggest cheers came when big tackles were made by either team. The players stayed on the field for about 30 minutes afterwards with plenty of people wanting their picture taken with them. 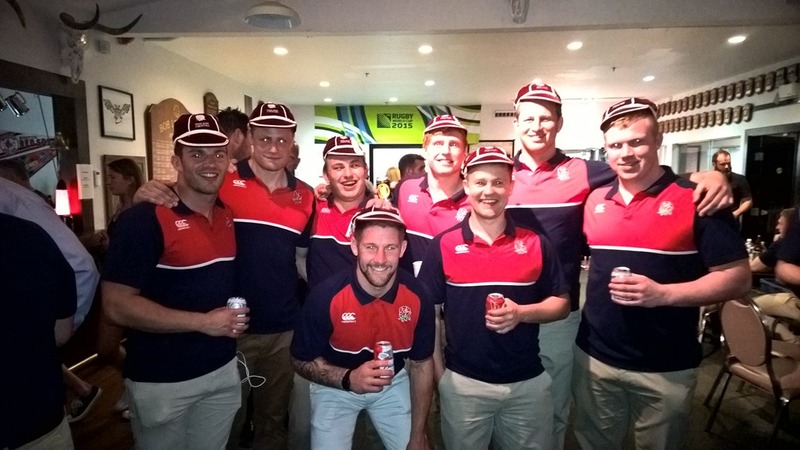 A touring side like England Counties is a big deal in Vancouver which this year hosted a leg of the World Rugby Sevens series for the first time in March. Then it was upstairs for curry and Capilano Rugby Pilsner before the formalities of speeches and presentations. Former Canadian international Mike James id the honours for BC Rugby, while I responded on behalf of the RFU and gave BC Rugby a plaque and some ties. It was then my privilege to present England Counties debutants with ties and those who had played their third game with caps. The socialising went on past 10pm when we all were taken downtown to The Pint, but it is probably better that what happened from then on remains unrecorded. So a successful outcome in the first city of the tour; next stop Calgary by coach although there is an overnight stay in Kelowna where the players are due to take part in some outreach work with local schoolchildren.